The Kingdom in all its glory! From Mayo (God help us) to the Kingdom of Kerry and more specifically to Dingle Harbour on a beautiful clear day. This lovely cabinet sized shot was taken from a high PoV giving a great vista of water and land in that special part of the island! Farrannakilla House, visible to the right: Streetview OSI 25"
St Mary's church is in the NIAH but doesn't help much, as it was built 1862-65. There was an archaeological impact assessment which has a comparison between this photo and an earlier one taken in 1891. This photo was assumed to be c. 1900. Hussey’s Folly, above, dates from 1845 and was built during the Great Famine (1845–’49) as a means of providing employment for the poor. It is named after the local land agent, R.M. Hussey. A section of land near the bottom of this scene shows many evenly spaced piles. Any guess as to what this might be? [http://www.flickr.com/photos/[email protected]/] Are they making Hay? I do notice two figures working to the right and I thought that might be the case, but such small hay stacks I have never seen. [https://www.flickr.com/photos/reedpedlow] If you look out nearer the sea, you can see that they make these little heaps, and then when after a bit of drying, they make real haystacks. 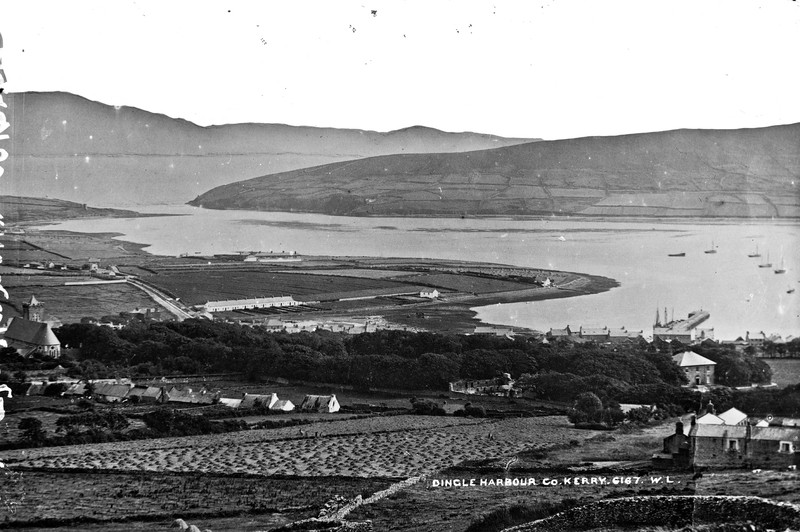 The new Coastgard Station, now Dingle Skellig Hotel site, was built in 1891. The coastguard station is from 1889 per the DIA. Sharons assessment has a shot where the yard buildings near Farranakilla are not ruined (well, the roof is partially gone...). here they are destroyed, but they are good on the 25", so I think we are after the 25" survey date of 1893. There must be a Dog here someplace? Muy buenas fotos antiguas . I wish I'd spotted this yesterday. This is familiar territory for me as I served in Dingle for 4 years. I'm afraid nothing from the photo above helps me date things more accurately. However, if this photo was taken at the same time: catalogue.nli.ie/Record/vtls000323147 then I think we can say that they are pre-1909. Back in 2009, the residents of a row of two-storey cottages built along the water's edge at "The Wood" celebrated the 100th anniversary of their houses: dinglenews.blogspot.ie/2009/06/dingle-cottages-prepare-to... These cottages _should_ be visible in the photo that beachcomber Australia links to. They aren't. So, if all photos are taken at the same time, I'd say, pre-1909. [https://www.flickr.com/photos/scorbet] Drat! I was hoping the faint lines on the map might have implied imminent action by the Congested Districts Board. [https://www.flickr.com/photos/[email protected]/] You’re correct. The new harbour/marina is late 20th Century.